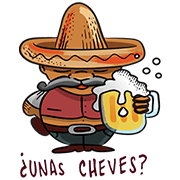 http://www.line-stickers.com/ – Mex Stickers Line Sticker | Inspired by Mexican popular culture, this collection features a diverse range of popular cultural references using simple and fun designs. Available till June 1, 2016. Next post PokoPoko & Rascal Tie-Up Stickers!